Your retail partners require a standard electronic data format to communicate and exchange information. Trust the industry’s leading platform for EDI compliance, EDI testing and EDI certification with SPS Commerce. Our process to connect you with your customers is unmatched. 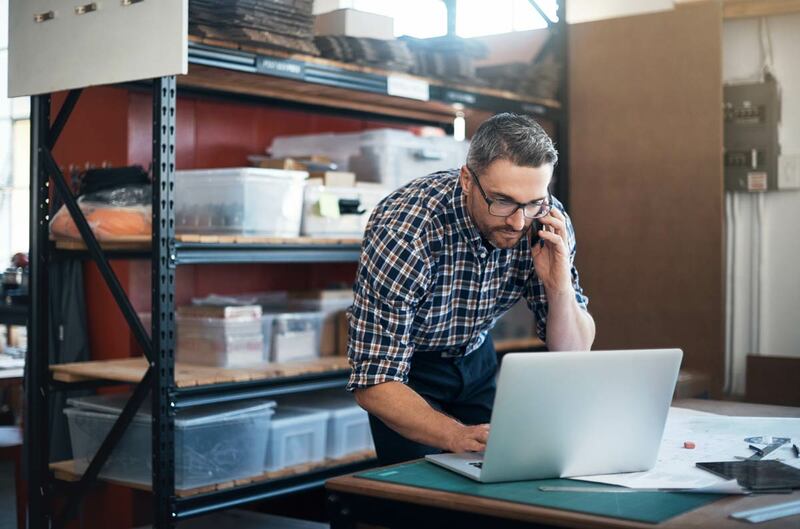 SPS Commerce can seamlessly and cost-effectively automate many of your business communications and order management processes with EDI testing and certification. What is EDI and EDI compliance? EDI is an abbreviation for electronic data interchange. EDI is essentially a system and standardized language that allows trading partners to communicate electronically, automatically, instead of faxing, emailing and other transmission of paper documents. EDI compliance refers to the ability to send and receive electronic documents in the specific data format that your retail partner requires, every time you exchange documents and transactions. To learn more about EDI, check out our EDI 101 guide. Our EDI testing service will prepare you to meet the compliance requirements of your retail customers –whether you’re adding a new retail partner or expanding an existing relationship. Whether you’re seeking EDI compliance with one partner, ten partners or 100, our system covers all the bases to get you to 100%. Access to a team of consultants to address your retailer’s business and technical EDI compliance requirements. Robust, end-to-end process that ensures a successful outcome into production. Connectivity testing via VAN, AS2 or FTP. How does SPS EDI testing and certification work? 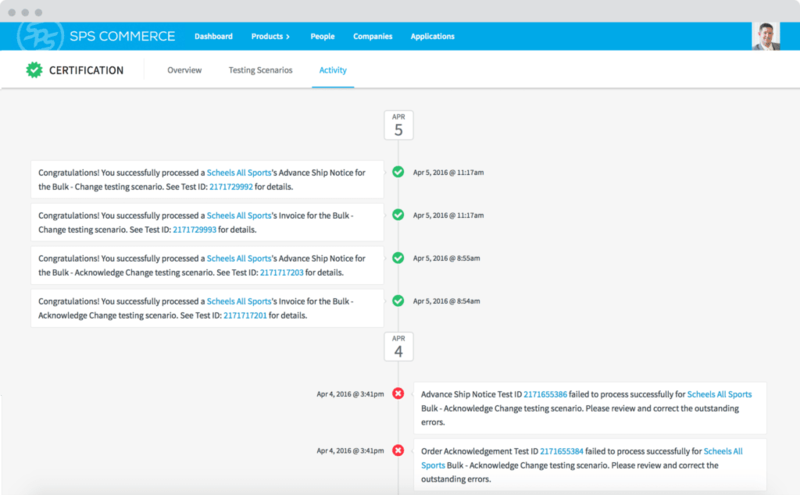 Using proven integrations battle-tested by thousands of companies, our Testing & Certification service helps you achieve EDI compliance quickly and ensures a successful outcome in production. 1. 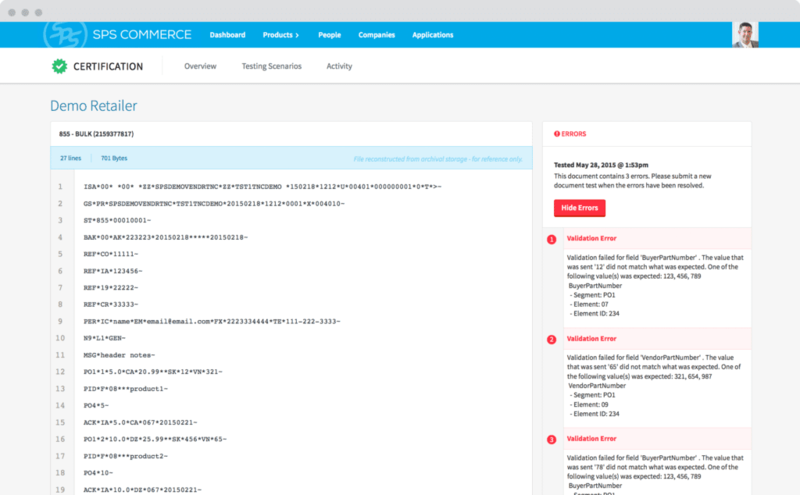 Your testing project will get access to an experienced team of SPS Commerce consultants. 2. Your SPS consultant team will guide you through your retailer’s specific requirements and technical specifications. 3. Together, you and your SPS consultant team will complete an exchange of test data. Each testing program incorporates a customized data set based on your retailer’s order management model and electronic trading requirements. 4. After your initial test is complete, your consultant team will partner with you to ensure success into production when you begin fulfilling orders with your retail customer. At the end of testing, you will be EDI capable and fully prepared to exchange data with the retailer. 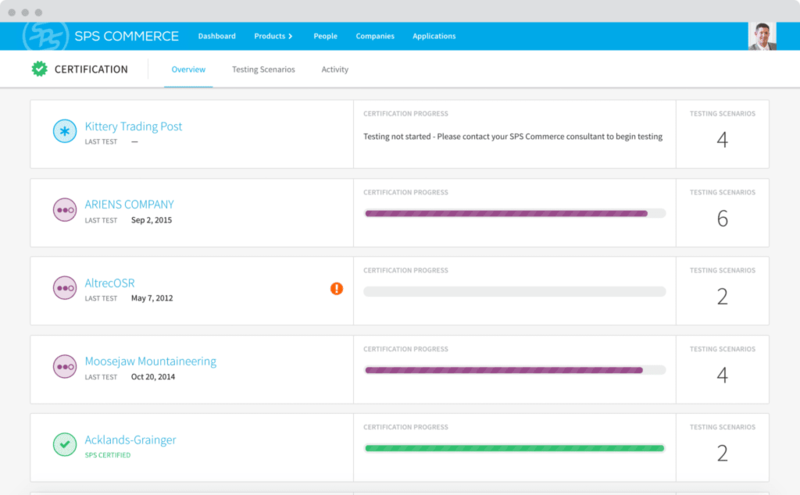 Quickly review your testing status, for all your retail partners. Visibility into every step of the data exchange process. Confirm EDI compliance. You are now fully prepared to exchange data with your retail partner! SPS Commerce is committed to making your trading relationships are successful, regardless of the systems you use or how you currently exchange data. With our unique and flexible approach, you can test and certify your own in-house EDI system, or use any third-party EDI service. As the leading retail-focused supply chain management network in the business, we are the trusted authority for thousands of EDI trading partners. 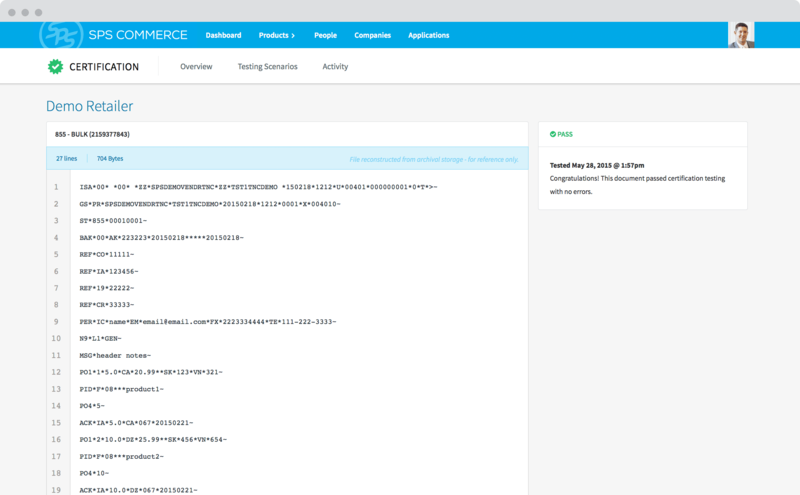 The SPS Commerce team has implemented tens of thousands of connections with hundreds of retailers. Our Testing & Certification process is for suppliers and vendors. If you are a retailer, check out our supplier EDI onboarding service. Or learn how to monitor vendor performance to evaluate compliance. Gain instant access to the largest network of up-to-date, mapped, EDI connections and more than 75,000 players in the retail space without having to configure or update any specs yourself. SPS Commerce has been pioneering retail automation since 2001 –– everything from EDI to full-scale retail change management. In that time there’s one thing we’ve learned: Innovative technology alone isn’t enough to thrive in today’s market. That’s why we provide a full-service continuum of services to all of our customers. When you partner with SPS, you’re not just getting best-in-class technology, you’re also getting a team of retail supply chain experts who are there to help plan, execute and manage it all for you. Our cloud-based products and system automations are designed to seamlessly bridge the gap that can exist between all of your business’s moving parts. Through SPS, your trading partners, fulfillment models, channels and systems can finally be integrated and connected. Remove the time and effort of taking on EDI testing yourself.